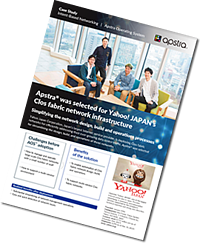 Learn how one of the largest Internet service providers in Japan — Yahoo Japan Corporation — dramatically streamlined the design, build, and operations of their data center network by deploying Apstra AOS® 2.1. Sean Hafeez, an early technical leader at Arista and Big Switch Networks and Director of Sales for APAC at Apstra, will cover how the company applied the same design, software, hardware and chip principles and selections as a hyperscale provider, but selected Apstra for automation software. Yahoo Japan Corporation required a new data center network infrastructure and more efficient network operations to support their big data requirements and massive growth in network traffic. The company evaluated many options including proprietary offerings from large established vendors and Do it Yourself (DIY) approaches deployed by hyperscale companies. Don't miss this opportunity to learn how a leading-edge service provider is implementing multi-vendor intent-based networking in production environments today. Download this in-depth case study that shows how Yahoo Japan Corporation is implementing a multi-vendor intent-based networking system in production today, and how they got here. A 20-year veteran of the tech industry, Sean held early key technical leadership roles in a number of successful start-ups and was heavily involved in product development, design and testing. He was an early Consulting Systems Engineer at Arista Networks, the company’s SCINET representative, and an integral contributor to the competitive positioning of products including the Arista 10G switch test which helped to drive Arista’s success on Wall Street. Sean also contributed to the establishment and success of Arista’s Asia Pacific team working as the first SE in APAC. At Big Switch Networks, where he was a Director of Sales for APAC, he was involved in the product design of Big Cloud Fabric. Sean is a bit wrangler at Apstra, Product Manger for the 1st release of AOS, and now leads APAC sales disrupting data center infrastructure.